I am very excited to be sharing this with you as I fell in love with these as soon as I made them. Not only are they a very light, airy and fluffy vanilla cake but they literally taste like lemon curd too. 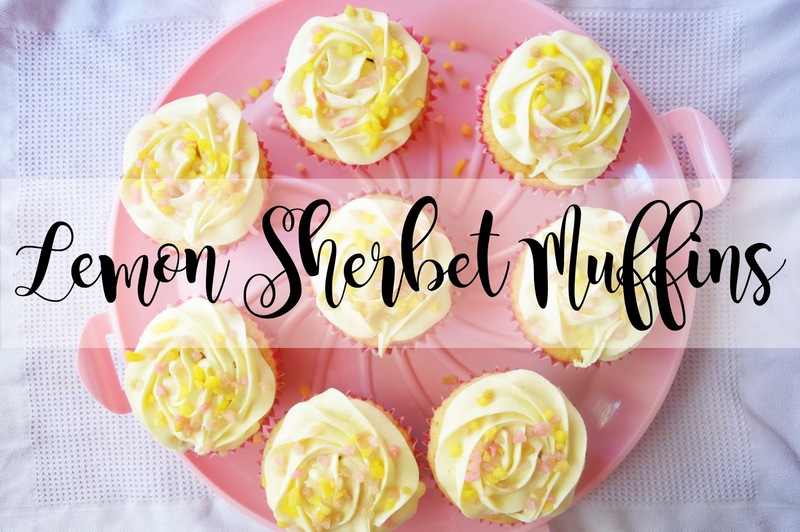 The sherbet pieces make these muffins just look very cute and girly and I can't help but stare at them. They were a real winner in my house and I'll definitely be making them again and I'd love to see you make them as well. Do you love cake? Do you love lemon? Combine them together and you will drooling all over these (hopefully not literally). Mix together the icing sugar, butter and lemon curd to form a smooth, light, airy frosting. Let me know if you make these and if you do tag me in them via twitter; @kimmcpherson_ or instagram; @_kimberleyjessica - I'd love to see your creations! Omg this really looks delicious!! So easy to make too! I've just pulled myself together after reading your chocolate dream cake post but this... THIS IS TOO MUCH TO HANDLE and they're decorated so pretty too!